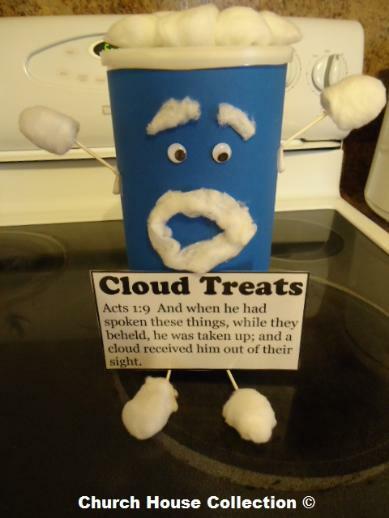 This is an empty oatmeal container that I turned into a cloud treat jar. You could fill the container with any kind of treat you want. Take it to church and hand the treats out to the kids. Use our Cloud Lesson that coordinates with this. Find a snack that looks like clouds to put into your cloud container. You could try making cloud cookies. They sell cloud cookie cutters online. Just goggle cloud cookie cutters and you will find some. You could also goggle cloud cookies and look through all the images on there to get an idea of how to decorate them. There are a lot of neat ones out there. You could also try making blue popcorn or blue popcorn balls. Or make round blue rice krispy treats and place them in a ziplock bag. Then just hand each child a napkin and pass them out. You might want to use white donut holes or blue cotton candy because they resemble clouds. Make cloud drinks by filling small plastic cups up with sprite and taping a lollipop to the inside of the cup and adding a small cloud like amount of cotton candy on to the end of the stick. Have the kids drop the cotton candy down in their drink and stir it up. You could always skip the part of taping the stick to the inside of the cup, and just hand them the stick of cotton candy instead so they can mix it in their drink. Or you can just do blue kool-aid and add some whipped cream to the top for clouds. 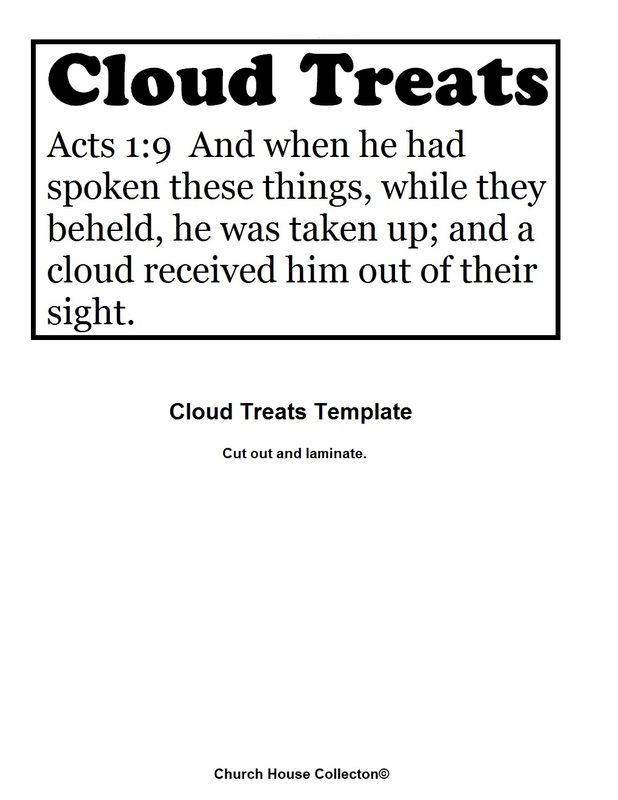 Tell the kids how Jesus was taken up in cloud in Acts 1:9. Here is my empty oatmeal container. Let's cover our container with some blue construction paper. This is what it should like now. You will have a small amount of the container still showing at the top. I took some left over blue construction paper that had a little cut off of it and taped it on so it would cover the top. Okay now our whole front is covered. Now let's get to his little arms. Grab 4 Q-Tips and bend the end of them just like it shows in the picture. Put the arm on by using some tape to hold it on. Tape all your arms and legs on. Now we are going to do the top of the lid in cotton balls. Just grab a handful of cotton balls and some tape. Fold some tape up and stick down on the lid. Then stick your cotton ball right on top of the tape. This is what the top of the lid should like now. A head full of clouds! Stick the lid back on top of the container. Almost done! This one is optional- You can give him some mittens and shoes by placing a cotton ball on top of the Q-Tip. If you want to do this part I would suggest taping them or gluing them so they will not fall off. They were not holding on very good. I need to tape them on so they will stay on. Next tape on some Google eyes and a cotton ball mouth. I just cut a cotton ball in half and began to pull it apart. It will unroll in strips. Just tape the mouth on in circle or you can just make a smile instead. Okay this is the close up of the cute little cloud treat container.